June | 2012 | Hotel Ascona Events & News : Hotel RENEWED ! “La Grotta” is a club where artists can exhibits in musical, artistic performances as public lectures, concerts, theatre etc. etc… La Grotta has professional sound and light system for the artists. 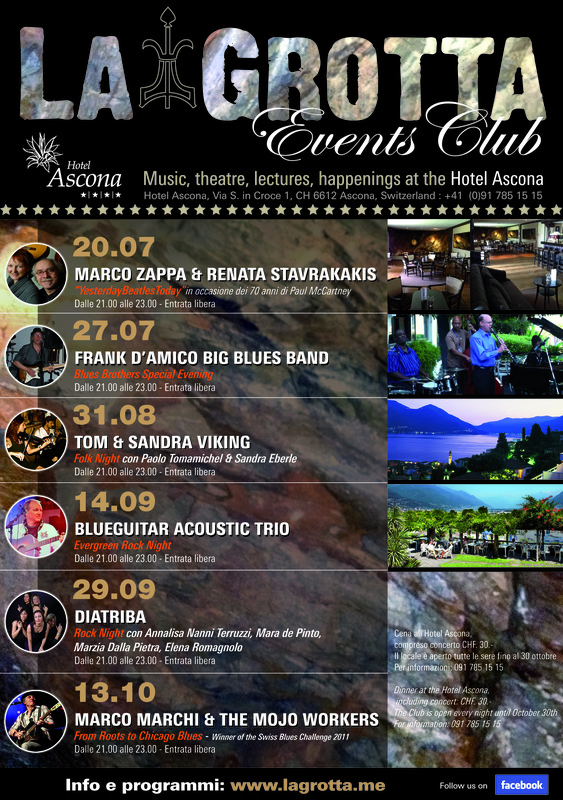 The entrance is free and free is the overnight in http://www.hotel-ascona.ch for the selected artists. La Grotta è un bar dove si svolgono eventi a carattere musicale tematico, letture di poesia e prosa,Jam Sessions, pièce teatrali e happening artistici. IL LOCALE È APERTO TUTTE LE SERE FINO AL 30 OTTOBRE. FOR YOU IS A GOOD DEAL MY FRIEND !!! The Swingberries are a small jewel of classic jazz. The band surprises for its extraordinary formula, comparable to a chamber orchestra, an interesting mix of rhythm and arrangements and a broad repertoire that goes from Duke Ellington to Johann Strauss, from Count Basie to Jacques Offenbach, and even from Fats Waller to Elvis Presley. The quartet members include Jérôme Etcheberry, trumpeter who, in the past, has been appreciated by the audience of JazzAscona, and clarinetist and saxophonist Aurélie Tropez, for the first time at the Ascona festival. 2010 Those Tours are announced : Syria (5-8) and Sweden (19-25) in March, Ascona Jazz Festival in Switzeland in July (2-4) – Locarno Film Festival in August (9-10). 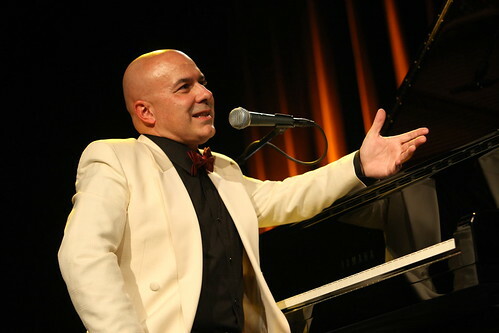 On 29th of April he recorded a live cd in Siderno (Reggio Calabria) Fahrenheit around the Night Club’s Italian Music, dedicated to Nicola Arigliano. (philology W741). In July recorded a TV Show for TVL Pistoia with his Swingtet. 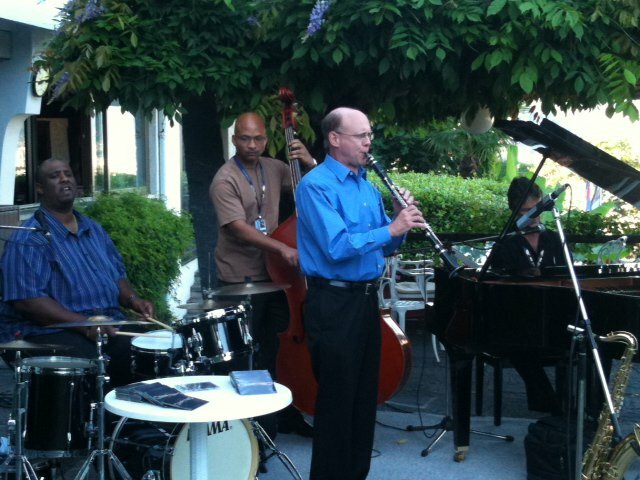 He performed in summer in several Italian Jazz Festival (Amantea, Baronissi, Fermo, Piazza Armerina, Trani). 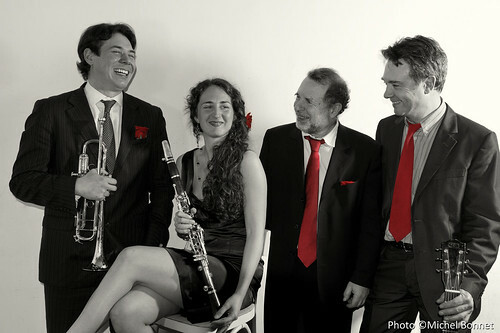 In november performed at European Jazz Expo in Cagliari. 2011 In January performed at Locarno on Ice with his new quintet from 2nd to 4th at Piazza Grande Jazz Festival. In February is planned a tour in Sweden with 9 concerts, 2 with the Sandviken Big Band e 7 with his Nat King Cole Trio. Among the concerts there will be the FESTIJAZZ in Vasteras and a concerti in Stockholm for the Italian Institute of Culture. In October performed by the Italian Institute of Culture in Budapest and 2 concerts for the Italian Institute of Culture in Praha. In October he performed also in Albania for the Italian Institute of Culture in Tirana and for the Italian Consulate of Valona. In October started a new school with Enzo Lanzo, The High Music Academy in Taranto where he is the Art Director and teaches advanced interpretation in Jazz Singing.